Built to Last AND Look Good! Driven pile foundations offer the most supportive AND held down installation available. We use a Marine Pile Driving Barge, manufactured out of steel, engineered specifically for driving deep foundation piles. Piles are hammer driven with up to 10,000 ft/lbs. of impact in every blow. Whether you need a Boat Lift, Jet Ski Lift, Yacht or Commercial Lift, we will provide a custom solution to meet your requirements. We are the area's premier dealer for Golden Boat Lifts. Every Golden Boat Lift comes with a 15 Year Structural Waranty, 10 Year SEA Drive Gear Waranty and a 2 Year Electrical Waranty. 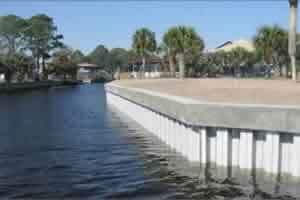 We didn’t set up our company to be one of the largest marine construction companies in the Wilmington NC area. We believe in excellence over size. 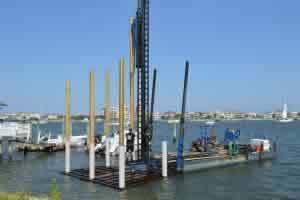 The systems we employ take the risk out of marine construction including: pile driving, bulk heads, floating docks, piers, gazebos, and boat lifts. 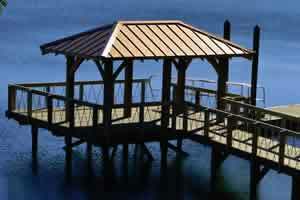 If your bulkhead, dock, pier, gazebo or boat lift has taken a beating and needs to be replaced, all we ask for is the opportunity to demonstrate our capabilities. We appreciate this opportunity to earn your business. We realize what it takes to acquire your trust, what it takes to produce the results you demand and whats necessary to eliminate many of the headaches and frustrations that are peculiar to marine construction projects. Thank you for your time and we look forward to working with you. If you would like to schedule an onsite review of your project please call us at 910.367.1348 .